Narrow gap welding, laser cladding, hybrid plasma-laser technique. Laser spot and seam welding. Laser welding of battery cases. "The Growth Rate of Allotriomorphic Ferrite in Low-Alloy Steel Weld Deposits"
Allotriomorphic Ferrite in Low-Alloy Steel Weld Deposits"
"A Model for the Development of Microstructure in Low-Alloy Steel (Fe-Mn-Si-C) Weld Deposits"
"Fe-Cr-C Hardfacing Alloys for High-Temperature Applications"
Proceedings of the First International Conference on Surface Engineering, ed. I. A. Bucklow, TWI, Abington, Cambridge, U.K.
"Development of Microstructure in the Fusion Zone of Steel Weld Deposits"
"The Austenite Grain Structure of Low-Alloy Steel Weld Deposits"
"An Analysis of Cooling Curves from the Fusion Zone of Steel Weld Deposits"
"Computer-Aided Design of Electrodes for Manual Metal Arc Welding"
editor W. Lucas, published by The Welding Institute, Abington, U.K.
"Prediction of Microstructure of the Fusion Zone of Multicomponent Steel Weld Deposits"
ASM, Metals Park, Ohio, U. S. A., 1987, pp. 225-229. "An Analysis of the Primary Microstructure of Cr and Mo Containing Low-Alloy Steel Welds"
Norwegian Institute of Technology, Norway. "Theory for the formation of Allotriomorphic Ferrite in Steel Weld Deposits"
Edited by J. Y. Koo, 1987, pp. 517-530. "Solute-Segregation, Oxygen Content and the Transformation-Start Temperatures of Steel Welds"
Warrendale, Pennsylvania. Edited by J. Y. Koo, 1987, pp. 495-504. "Reaustenisation in Steel Weld Deposits"
Edited by J. Y. Koo, 1987, pp. 549-563. "Stability, Wear Resistance and Microstructure of Fe-Cr-C and Fe-Cr-Si-C Hardfacing Alloys"
Institute of Metals, London, July 1988, pp. 39-43. Metallurgical Transactions, Vol. 19A, 1988, pp. 669-674. "A Model for the Prediction of Strength in Steel Welds"
"Nitrogen in Submerged-Arc Weld Deposits"
Journal of Materials Science Letters, Vol. 7, 1988, pp. 610-612. "Computer-Aided Design of Electrodes for Arc Welding Processes: Part II"
"The Design of Submerged Arc Weld Deposits for High-Strength Steels"
4-5 July 1988. Published by Pergamon Press, Oxford, 1988, pp. 71-78. Hardfacing Alloys Deposited by Arc Welding and Laser Cladding"
Metallurgical Transactions A, Vol. 20A, 1989, pp. 1037-1054. Journal of Materials Science, Vol. 24, 1989, pp. 3180-3188. Part I: Method of theoretical assessment"
Joining and Materials, Vol. 2, 1989, pp. 182R-187R. "The Estimation of Non-Uniform Elongation in Low-Alloy Steel Weld Deposits"
Journal of Materials Science, Vol. 25, 1990, pp. 613-618. "Nickel-Based Hardfacing Alloys for High Temperature Applications"
"Reaustenitisation Experiments on Some High-Strength Steel Weld Deposits"
Materials Science and Engineering, Vol. A118, 1989, pp. 155-170. "Microstructural Entropy and the Scatter in Toughness"
Ohio, U. S. A., 1989, 745-748. "Silicon Modification of Iron Base Hardfacing Alloys"
Ohio, U. S. A., 1989, 273-278. "Complete Reaustenitisation in Multirun Steel Weld Deposits"
ASM International, Ohio, U. S. A., 1989, 205-210. "Microstructure and Stability of Fe-Cr-C Hardfacing Alloys"
"Control of Weld Metal Microstructure and Properties"
American Welding Society, November 1990, pp. 34-69a. "Microstructural Development in an HSLA80 Laser Beam Weldment"
Vol. 2500, 1994, pp. 846-853. "Computer Modelling of Low Alloy Steel Welds"
Welding & Metal Fabrication, Vol. 64, 1995, 23-24. A Bayesian Neural Network Analysis"
Materials Science and Technology, Vol. 11, 1995, 1046-1051. "Modelling of Fundamental Phenomena in Welds"
"Calculation of Microstructure and Properties of Steel Welds"
Institute of Materials, 1995, pp. 15-24. "Modelling the Inclusion Nucleation Potency in Steel Welds"
American Welding Society, Florida, U.S.A., 1993, pp. 195-202. "Model for Boron Effects in Steel Welds"
American Welding Society, Florida, U.S.A., 1993, pp. 153-160. "Calculation of the Volume Fraction of Phases from CCT Curves"
American Welding Society, Florida, U.S.A., 1993, pp. 306-313. "Modelling of Precipitation Sequences at Dissimilar Steel Joints"
American Welding Society, Florida, U.S.A., 1993, pp. 215-221. "A Model for Multipass Steel Welds"
Acta Metallurgica et Materialia, Vol. 42, 1994, 3663-3678. "Modelling of Brittle Zones in the HAZ of Steel Welds"
American Welding Society, Florida, U.S.A., 1993, 186-193. "Microstructures in Hot Wire Laser Beam Welding of HY80 Steel"
Materials Science and Technology, Vol. 10, 1994, 56-59. Materials Science and Engineering A, Vol. A178, 1994, pp. 189-194. "Carbon Redistribution at Dissimilar Steel Joints"
ASM International, Ohio, USA, 1992, pp. 315-320. ASM International, Ohio, USA, 1992, pp. 181-186. "Simulation of Weld Metal Microstructure and Properties"
Elsevier Science Publishers, B.V., 1993, 1729-1734. Materials Science and Technology, Vol. 8, 1992, pp. 123-133.
of Low-Alloy Steel Weld Deposits"
Journal of Materials Science Letters, Vol. 10, 1991, 142-144. "Solidification Sequences in Stainless Steel Dissimilar Alloy Welds"
Materials Science and Technology, Vol. 7, 1991, pp. 50-61. "The Yield and Ultimate Tensile Strengths of Steel Welds"
"Model for Solidification Cracking in Low-Alloy Steel Weld Metals "
Science and Technology of Welding and Joining, Vol. 1, 1996, pp. 43-50. "Modelling of Allotriomorphic Ferrite in Steel Welds"
Institute of Materials, 1997, 181-198. "Model for Solidification Cracking in Low-Alloy Steel Weld Metals"
"Inoculation of Steel Welds with Non-Metallic Particles"
Materials Science and Engineering A, Vol. 223, 1997, pp. 146-157. "Scatter in High Strength Steel Weld properties due to Interpass Temperature "
Trends in Welding Research, eds S. A. David, T. DebRoy, J. A. Johnson, H. B. Smartt and J. M. Vitek, ASM International, Ohio, 1999, pp. 870-875. "New Welding Alloys, Computational Methods"
Svetsaren, Vol. 53, 1998, 22-25. "Modelling of Phase Transformations in Steel Welds"
Proceedings of ECOMAP '98 (Environment Concious Innovative Materials Processing), Kyoto, Japan, published by the High Temperature Society of Japan, (1998) pp. 35-44. "Charpy Impact Transition Temperature for some Ferritic Steel Welds"
Australasian Welding Journal, Vol. 45, 2000, pp. 33-37. "Modelling the Creep Rupture Strength of Ferritic Steel Welds"
Science and Technology of Welding and Joining, Vol. 5, 2000, 81-90. 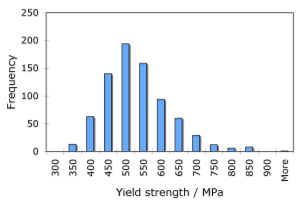 "Estimation of the Mechanical Properties of Ferritic Steel Welds, Part I: Yield and Tensile Strength." Science and Technology of Welding and Joining, Vol.5, 2000, pp. 135-147. "Estimation of the Mechanical Properties of Ferritic Steel Welds, Part II: Elongation and Charpy Toughness." Science and Technology of Welding and Joining, Vol.5, 2000, pp. 149-160. "HAZ hardness in Laser Beam Welds"
Proceedings of The Laser Insitute of America, Vol. 87, 2000, E138-E145. "Bruscato Factor in Temper Embrittlement of Welds"
Science and Technology of Welding and Joining, Vol. 5, 2000, pp. 338-340. "Estimation of Microstructure in Steel Welds"
editor U. Dilthey, published by Shaker Verlag, Aachen, Germany, 2001, pp. 817-830. "Analysis of Strength and Ductility of Welds in Shipbuilding Steels"
Science and Technology of Welding and Joining, Vol. 6, 2001, 116-124. "Analysis of the Toughness of Welds in Shipbuilding Steels"
Science and Technology of Welding and Joining, Vol. 6, 2001, 368-374.
" Characteristics of High-Power Diode-Laser Welds for Industrial Assembly"
Proceedings of the 20th ICALEO 2001, Florida, Vols. 92 and 93, 1321-1330. "Secondary effects in neural network analysis of the mechanical properties of welding alloys for HSLA shipbuilding steels"
"Strong and Tough Steel Welds"
Published by the Institute of Materials, eds H. Cerjak and H. K. D. H. Bhadeshia, 2002, 205-230. "Components of the Creep Strength of Steel Welds"
"Prediction of Ferrite Number in Stainless Steels"
"High Strength Steel Weld Metals: Developments with Ni and Mn"
Proceedings of the 7th International Welding Symposium, Japan Welding Society, 20-22 November 2001, Kobe, Japan. Edited by T. Ohji, published by the Japan Welding Society, Tokyo, pp. 797-802.
" Microstructural change in high-temperature heat-affected zone of low-carbon weldable 13% Cr martensitic stainless steels"
Stainless Steel World, October (2002) 16-23. "Complex Weldment Properties: Trends in Predictive Power"
Trends in Welding Research, eds S. A. David, J. Vitek, T. Debroy, J. Lippold and H. Smartt, ASM International, USA, 2002, 680--689. Trends in Welding Research, eds S. A. David, J. Vitek, T. Debroy, J. Lippold and H. Smartt, ASM International, USA, 2002, 719-723. "Microstructure and Mechanical Effects of Ni and Mn on Strong-Steel Weld Metals"
"Joining of Commercial Aluminium Alloys"
Proceedings of an International Conference on Aluminium (INCAL '03), Aluminium Association of India, 2003, 777-783. Proceedings of International Conference: Joining and Welding Solutions to Industrial Problems, JWRI, Osaka University, Japan, 2003, pp. 43-52. "Finite Element Simulation of Laser Spot Welding"
Science and Technology of Welding and Joining, Vol. 8, 2003, 377-384. "Prediction of Cooling Rate and Microstructure in Laser Spot Welds"
Science and Technology of Welding and Joining, Vol. 8, 2003, 391-399. "Reliability of Weld Microstructure and Property Calculations"
Welding Journal, Vol. 83, 2004, 237s-243s. "Understanding Mechanical Properties of Novel High Strength Steel Weld Metals Through High-Resolution Microstructural Investigations"
Trends in Welding Research, ASM International, eds S. A. David, T. DebRoy, J. C. Lippold, H. B. Smart and J. M. Vitek, 2005, pp. 969-974. "Influence of C, Mn and Ni on Strong Steel Weld Metals: Parts 1-3"
Science and Technology of Welding and Joining, Vol. 11 (2006) 1-24. "New Developments with C-Mn-Ni High-Strength Weld Metals, Part A - Microstructure"
Welding Journal, Vol. 85 (2006) 200s-210s. "Transformation Plasticity in Steel Weld Metals"
"In situ Monitoring of Weld Transformations to control Weld Residual Stresses"
"Characterising Phase Transformations and their Effects on Ferritic Weld Residual Stresses with X-rays and Neutrons"
Metallurgical and Materials Transactions A 39A (2008) 3070-3078. "Recent Advances in Friction Stir Welding"
Progress in Materials Science, Vol. 53, 2008, 980-1023. "Joining Ceramics to Metals using Metallic Foam"
Materials Science and Engineering, Vol. A496 (2008) 501-506. "Optimization of Neural Network for Charpy Toughness of Steel Welds"
Materials and Manufacturing Processes 24 (2009) 16-21. "Critical Assessment: Friction-Stir Welding of Steels"
Science and Technology of Welding and Joining, Vol. 14, 2009, 193-196. "Friction stir welding of dissimilar alloys"
Science and Technology of Welding and Joining, 15 (2010) 266-270. "Back of the envelope calculations in friction stir welding - velocities, peak temperature, torque, and hardness"
Acta Materialia, 59 (2011) 2020-2028. "Stainless steel weld metal designed to mitigate residual stresses"
Science and Technology of Welding and Joining 14 (2009) 559-565. "Alloying Concepts for Low Transformation Temperature Welding Consumables"
"Accumulation of stress in constrained assemblies: novel Satoh test configuration"
Science and Technology of Welding and Joining 15 (2010) 497-499. "Friction Stir Welding and Processing"
Science and Technology of Welding and Joining 15 (2010) 646-647. "Some European Developments in Welding Consumables"
Journal of the Japan Welding Society 80 (2011) 110-119. "Design of Weld Fillers for Mitigation of Residual Stresses in Ferritic and Austenitic Steel Welds"
Science and Technology of Welding and Joining 16 (2011) 279-284. "1000 Gems: A celebration of STWJ"
Science and Technology of Welding and Joining 16 (2011) 285-287. "Tools for Friction Stir Welding"
Science and Technology of Welding and Joining 16 (2011) 325-342.